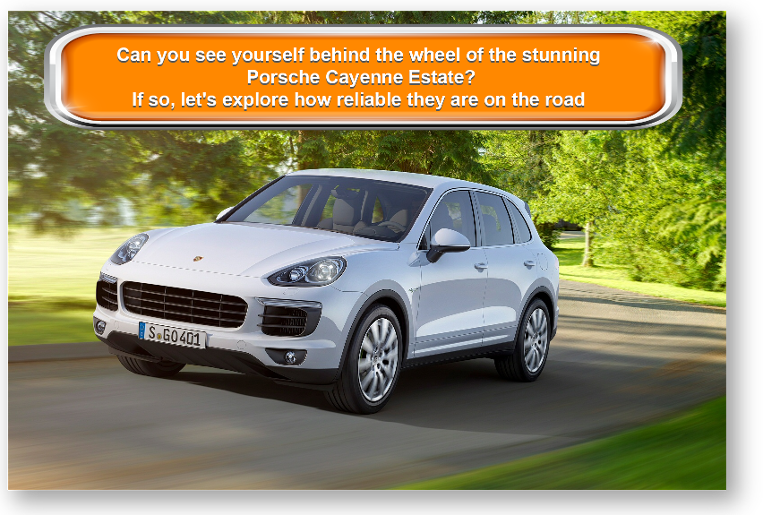 Looking for an objective review of the Porsche Cayenne Estate? OSV has got you covered, from engines to lease deals. The powerful new Porsche Cayenne Estate has lots of road presence and combines the usability of an SUV with the character, speed and poise of a sports car. As such, it’s got bags of appeal for those of you who need a hefty new family car, but don’t want to sacrifice the thrill of the drive entirely. You want something to cope with everyday family life, but you also want to have a bit of fun. When this ostentatious family-friendly car was first launched, there were a few raised eyebrows. People thought it couldn’t work. Fast forward to 2017, and it’s now Porsche’s best-selling car. As it turns out, families just love its blend of performance and practicality. Add to the fact that it’s got plenty of badge appeal, and this is a very desirable machine. OSV takes a closer look at what it’s all about with our 2017 Porsche Cayenne Esate review. SUV’s are meant to be sporty – but most aren’t. However, the Porsche Cayenne is. Despite its sheer size and weight, even its smallest engine can haul you from a standstill to 62mph in just over 7.0 seconds. If you could do that in a hatchback you’d be grinning from ear to ear, so imagine how you’ll feel when you accomplish it in a big ol’ SUV. This smallest engine in question is a basic diesel engine that delivers up to 262 bhp. For more explosive acceleration, you may want to take a look at the Diesel S, which can do the 0-62 time in 5.4 seconds. It can move you along swiftly without any hassle, and you don’t even need to work the engine to death to get the best out of it. It’s very compliant. There is a hybrid engine available that produces a whopping 416 bhp. The problem is that it adds more weight to the car, which slows things down a bit. As such, it powers its way from rest to 62 in just under 6.0 seconds. 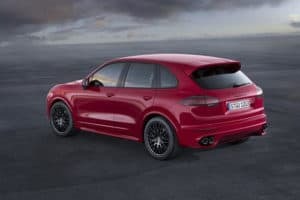 If you keep it in totally electric mode, the engine remains nice and smooth, but the added power from the V6 engine really brings the Cayenne to life. There are also petrol engines in the range, including a 420bhp V6 model that guns you from rest to 62mph in 5.5 seconds. A turbocharged 4.8-litre V8 engine, meanwhile, scorches the earth from 0-62 in just 4.5 seconds before maxing out at 173 mph. As a result, it turns the Cayenne into one of the quickest sports utility vehicles on the planet. Our pick of the engines is the GTS, which is arguably the most entertaining to drive. It’s powered by a V6 3.6-litre twin-turbo petrol engine, develops up to 434 bhp, and does 0-62mph in 5.2 seconds. It emits a sporty note, thanks to its sports exhaust and like all the other models benefits from four-wheel drive and accurate steering. Indeed, you may even forget that you’re behind the wheel of a mega-tonne SUV once you’re up and running. Handling is so refined that it transforms the car into a sports saloon that can tackle even twisting country roads with litheness. The wraparound dashboard is effective, and suits the cabin’s character, despite the fact that you’re sat fairly high up. The supportive leather seats are comfortable and hold you in place nicely, while the optional air suspension will provide further comfort. The interior is gorgeous to look at, and feels well put together. Attention to detail is second to none, with even the switches looking as though they’re the product of a master craftsman. A minor criticism would be that there are too many switches and buttons on your centre console, while its touchscreen system can’t compete with BMW’s iDrive. Another drawback is that the Cayenne isn’t the most refined SUV around, especially on the motorway. It’s tempting to add the bigger alloys, but they will rumble loudly and may cause a stir that can start to grate when you just want to relax on longer journeys. The new Cayenne is overall family friendly, though. It’s spacious, and boasts a massive 670-litre boot. This makes it one of the biggest in its class. You can fold down the rear seats to extend the space to 1,728-litres, and a wide opening makes it easy to use. In a nice touch, Porsche offer an electrically powered tailgate to all models. The Cayenne is strictly a five-seater, so if you’re looking for seven seats you’ll need to look elsewhere. Five adults get lots of leg and headroom – more than last time around, as this is a longer model. Adults in the back can adjust the amount of legroom they have by sliding the rear seats back, while storage spaces include reasonably sized door bins and a big glove box. Standard equipment is decent but not fantastic. The basic model gets 18” alloys, cruise control, a powered tailgate, twin-zone climate control, a 7” touchscreen and electrically adjustable seats. The list of optional extras is as expected – long and expensive. On it is satellite navigate and a better Bose stereo system, as well as wireless internet and DAB digital radio (the entry level Cayenne misses out on this, which is disappointing. It also misses out on Bluetooth connectivity. Prices for the new car start out from £52,700 and rise to £120,000. If you prefer to lease and would like more information on our lease deals, check out our page here. The Cayenne is both big and high performing, and as a consequence running costs are not exemplary. The hybrid is, as expected, the most frugal model in the range, but claimed returns of 83.1mpg will not be possible all the time. If you switch to Sport mode and unleash this car’s true potential, you might see those numbers plummet to 25mpg. It is, however, free from road tax. The diesel model will be the most popular with buyers, and it can achieve average fuel economy returns of 42.8mpg. The Cayenne Diesel S, meanwhile, is good for 35.3mpg and will cost £285 a year in road tax. The petrol model is the most expensive to keep on the road, and you can’t expect better returns than 29.7mpg. It seems odd to say that an SUV handles like a dream, but to heck with it. If you need a big car but are actually wanting something sportier, this is like a dream come true. Plenty of grip on offer which adds steely composure when you enter corners. There are seven engines to choose from, and all are belters. Families might wince at the running costs, but if you can afford the listing price you might not too surprised to see how much the Cayenne costs to stay on the tarmac. Turbo models offer awesome driving dynamics, but are expensive. So is the list of optional extras. Let’s see how the car measures up against its rivals in the comparison section of our 2017 Porsche Cayenne Estate review. 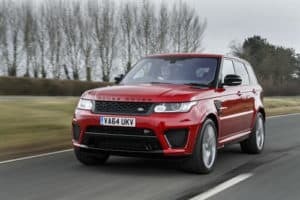 The new Range Rover Sport SUV is a luxurious but equally robust 4 x 4 that delivers exceptional ride quality – but unexceptional running costs. For a hefty 4 x4, the Range Rover Sport equips itself on the road. It’s quick and handles well, and boasts a smooth-shifting 8-speed automatic transmission. Moreover, Land Rover have done a stellar job at trimming some weight off their prized machine so that it’s now lighter than last time. Make no mistake – this hasn’t resulted in a twinkle-toed beast. But it does feel more responsive in bends, and it is faster in a straight line. There are a handful of petrol engines to choose from, all of which are built for monstrous performance. There is actually only engine available – a V8 5.0-litre unit, but it comes in two power guises. The 503 bhp still has enough in its tank to storm its way from a standstill to 62mpg in 5.0 seconds, while the 542 bhp can do it in 4.7 seconds. A quite monumental achievement for such a big car. The diesel engines are much slower, with the 3.0-litre V6 doing 0-62 in 6.8 seconds and a 4.4-litre SDV8 power plant doing the same distance in 6.5 seconds. A hybrid version takes care of it in 6.4 seconds. If you’re thinking of turning to the diesel or hybrid models in a bid to keep running costs down, you might be a tad disappointed. The cheapest model to run in the range is indeed the hybrid model, but average fuel economy returns of 44.14mpg are nothing to write home about. The annual £205 road tax bill is also eye-catching, but for all the wrong reasons. However, it’s much cheaper than the petrol engines, with the V8 petrol only able to return 22.1mpg at best. The cabin might persuade you to take a chance on the Range Rover Sport. Like the Porsche, it’s absolutely gorgeous and will make you feel right at home. On those cold wintry nights, it will feel like home! Build quality is exceptional, there are luxurious touches everywhere, while refinement is much better than in the Cayenne. And because this is such a huge car, it figures that it’s super practical. It’s smaller than the standard Range Rover, but can still boast the kind of dimensions that would have a small hot hatch quaking in its boot. It casts one heck of a shadow! Visibility is good, tall adults should have a good amount of space in the rear (though knee room is a bit weak), and, unlike the Porsche, the car comes with the option of a third row of seats. However, this extra row is really only suitable for your kids. The boot measures 784-litres if you stick with five seats, which is over a hundred litres more space than you get in the Cayenne. The new BMW X6 SUV boasts a polarising design which has divided opinion. It doesn’t look like an SUV, but if you want your big car to come with coupe looks and bags of power and performance, this one might be worth a closer look. The new BMW X6 SUV looks as though it’s not in the mood to suffer fools lightly, and some serious road presence goes hand in hand with its aggressive looks. It’s a heavy car that tips the scales at over 2,000kg, but the German brand have done a good job at hiding that weight. It glides along the road more like a coupe than a steamroller, body lean is minimal, and there is a lot of grip. There are two petrol engines on offer, and both are capable of outstanding performance. The 444bhp xDrive50i is the smallest of the two, but can still rocket you from rest to 62 in 4.8 seconds. Its soundtrack is viscous and enjoyable, but the grin might be wiped off your face when you see the running costs. The other petrol engine is unique to the X6 M. It produces up to 576 bhp, and can get you from 0-62 in 4.2 seconds. The most popular engine so far though has proven to be a 30d diesel engine. It delivers 254 bhp, and can thrust you from rest to 62mph in 6.7 seconds. It’s good for everyday driving, and buyers appreciate its economy. 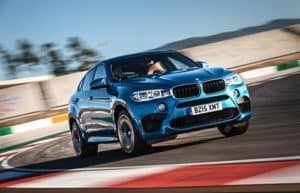 Average returns of 47.1mpg are not spectacular, but they’re much better than the crippling 25.4mpg managed by the X6 M.
Overall, the BMW X6 SUV is not cheap to run or tax, but a Service Inclusive Package will help you to manage the maintenance costs of this car over five years. It costs £575. The X6’s cabin looks almost identical to the X5’s. Visibility at the front is good, thanks to the raised suspension, while both the driver’s seat and steering wheel offer a good amount of adjustability. However, checking to see what’s behind you isn’t easy, while the sheer size of this car means parking is also a challenge. Like all modern BMWs, the X6 gets the brands iDrive infotainment system, as well as a 10.25” wide screen. All of this makes your life easier by limiting the amount of buttons on the dash. Practicality is okay, but not as good as the X5’s or the Cayenne’s. However, there have been improvements. 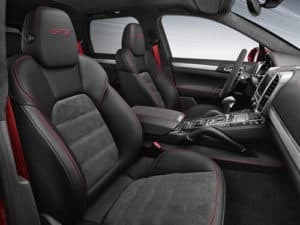 For example, BMW have ditched its pair of individual rear seats for a traditional three-seater back bench, while there is now more leg and headroom. The boot is bigger, and measures 580-litres, but this is still some way off what the Cayenne can offer. One of the reasons for this is the sloping roofline which, although it might bless the car with its edgy looks, compromises its usability. You need a big car to cope with family life on the road, but you pine for the days when you could whizz down stretches of roads in a sports car without a care in the world. You want the practicality and sheer might of a premium SUV, but you also want the flighty agility of a coupe. You want to power your way through muddy roads on dark wintry nights, but you also want to cruise down a smoky Eastern European country lane. You can do all of this in the new Porsche Cayenne Estate. Looking For A Price For The Porsche Cayenne Estate?